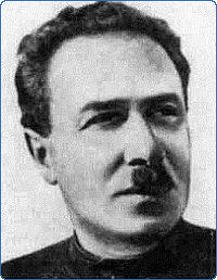 Born on November 4, 1889 in Vitebsk (in the family of Faifel Nakhimovich Rozengoltc). In 1908 joined Russian Social Democratic Workers Party. Since 1917 – participation in various Soviet government bodies (the executive committee of the Moscow Soviet, the Moscow Military Revolutionary Committee, the Revolutionary Military Council of the Soviet Republic, the fronts and armies, People's Commissariats RSFSR). 07.12.1918 - 03.18.1919 Member of the Revolutionary Military Council of the 8th Army of the Red Army. Conducted secret negotiations on the cooperation of the Red Army and the Reichswehr in 1922. Member of the Revolutionary Military Council of the Western Front. From January 1922 – Head of Glavvozduhflot (Air Fleet Directorate). Since 1922 –Chief of Air Fleet of the Red Army. Since July 1923 – Head of the Red Army Air Force. Since November 1924 – member of the Revolutionary Military Council of the USSR. Since April 1925 the Red Army was in reserve. In 1925-1927 – counsellor and charge d'affaires of the Soviet Embassy in the UK. In 1927, the British government broke off diplomatic relations with the USSR, referring to Soviet intelligence activities in the country ("ARCOS affaire"). From 1927 to 1934 - member of the Central Control Commission of the Communist Party and a candidate member of the Presidium of the Central Control Commission (from 1930 to 1932 - Member of the Presidium of the CCC). In October and November 1930 the Deputy People's Commissar for Foreign and Internal Trade of the USSR, then People's Commissar for Foreign Trade (until 1937). In August and October 1937, he headed the state reserves at the Soviet Government. Since 1934 – a candidate member of the Central Committee of the Party. On October 7, 1937 he was arrested. On March 13, 1938 sentenced to death. Executed on March 15, 1938.